Gently massage into affected area until absorbed. Repeat as needed. Organic, unrefined coconut oil provides a silky foundation for this rich, topical anti-inflammatory skin balm. 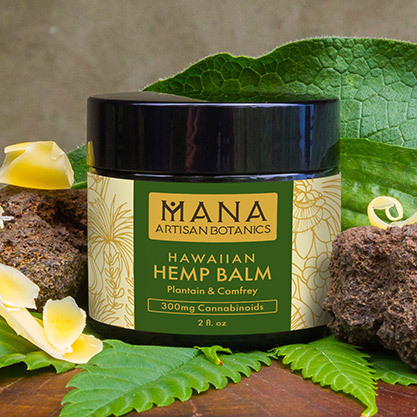 A combination of phytocannabinoid-rich organic hemp, Honaunau Farm comfrey and plantain are the basis of this soothing medley. Topical application of cannabidiol (CBD) allows direct reach to the receptors located throughout the skin and subdermal tissues that affect pain, inflammation and itching. Full spectrum hemp incorporates not only CBD but more than 100 other cannabinoids that assist with healing. The synergistic combination with traditional wound mending herbs, this aromatic balm helps minimize acute and chronic pain, swelling, tissue damage, and eczema. The uplifting aroma and beneficial properties of lemongrass, peppermint, and lavender essential oils promote healthy tissue growth, reduce pain, and repair damaged skin (not for use on open, deep wounds). An ideal choice for targeted relief of localized discomfort. This balm delivers 150mg of phytocannabinoids in every ounce. *Also available unscented for those with sensitivities.